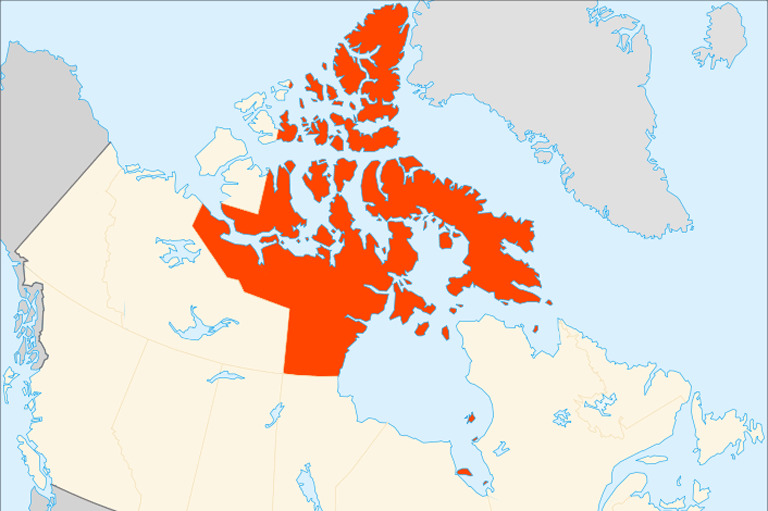 On April 1, 1999, the map of Canada was redrawn: the Northwest Territories divides into two territories to allow for the creation of Nunavut, a homeland for Canada’s Inuit. The creation of Nunavut is testament to the strength of Inuit political leaders and to the flexibility of Canadian political institutions. Over the past six years, Inuit leaders have been busy preparing for this event. Everything from new symbols on flags and licence plates to new buildings to house a legislative assembly to new electoral districts and election of a new governing territorial assembly has been prepared in anticipation of this moment. And now, the real work begins. The new territory of Nunavut is geographically large, with a unique variety of landscapes and ecosystems. The whole territory, from the glacial mountain fiords of the east coast of Baffin Island to the rolling rock hills of the west coast of Hudson Bay, is arctic terrain, which means that it is all to the north of the treeline. What remains of the N.W.T. is frequently called the western Arctic but more appropliately should be called subarctic, since the vastest portion of that territory lies within the treeline. Nunavut can best be described with reference to the distinctive culture, history, and politics of the majority of its inhabitants, who are Inuit. Inuit is an Inuktitut language word for people. Inuk for person. For much of recent history they were known as Eskimos , but obviously preferred the substitution of their own term for themselves. While the striking aspects of their material culture are well known — iglu (snowhouse) and kayak (small boat) perhaps better than ulu (woman’s knife) and umiak (large boat) — their intellectual culture and values have served Inuit as well in the modern world as their unique technology did in earlier ages. For the most part, Inuit prize flexibility and ingenuity — a good idea is not something to hold back in the interest of maintaining the way things were always done. At the same time, elders and ancient traditions are highly respected. Balancing these two — an appreciation for newness and respect for the wisdom of the ages — will be one of the challenges of Nunavut. Archaeologists maintain that modern Inuit, who certainly have a language and culture distinct from that of other indigenous Americans, are the descendants of Thule peoples who were late (and last) to cross the Bering Strait, coming as recently as a millennium ago. Inuit have a rich legacy of creation stories, some of which affirm their belief that they were placed in their homeland by their own creator. Traditional Inuit culture remains strong in Arctic communities because Inuit continue to depend to a great extent on hunting to get enough food to survive (and food sharing remains a critical aspect of community economies). Inuit visual arts have provided strong expressive mechanisms for the transmission of Inuit culture, and the Inuit language, Inuktitut, has remained resilient, due in part to a deliberate policy of Inuit leaders. In the playgrounds of the many Arctic communities I have visited, the language of play has been Inuktitut — surely as good an indicator as any of a language’s vitality. The history of the Arctic is rich and complex. Though most historians have focused attention on explorers and expeditions, cultural contact in the Arctic and Inuit responses to colonialism are compelling themes that will continue to gain increasing scholarly and public attention. Although nineteenth-century whaling had some local impact, for the most part Inuit economic life remained in its indigenous pattern until the fox and seal fur trades of our own century. Hence there were Inuit Canadians who as late as the 1950s had little or no exposure to outsiders. Permanent settlement into communities was for many Inuit a phenomenon of the fifties and sixties. One of the biggest challenges facing the leaders of Nunavut will be to find a way out of the economic dependence that has become the most debilitating legacy of colonial relations. Many of those leaders were born “on the land” in what amounts to another world. Politically the Arctic islands became part of Canada in 1880, though virtually nothing was done about them until 1897 when William Wakeham, co-chairman of an international boundary commission, ceremonially hoisted a flag at Kekerton Island in Cumberland Sound, now a historic Territorial park. Map of Canada, Nunavut outlined. It was not until 1921 that an appointed council composed of Ottawa-based civil-servants, began to actively govern the Arctic and instituted the series of annual eastern Arctic ship patrols that brought supplies and services to coastal communities. The status of Inuit, legally uncertain, was settled in 1939 in the Supreme Court of Canada decision Re: Eskimos, which determined Inuit were a federal responsibility and in effect, aboriginal citizens; however, Inuit were not directly consulted about the governance of their lands and communities until the late fifties. In 1965 Abraham Okpik became the first Inuk appointed to the territorial council. In 1966 the council expanded to include seven elected members, with Simonie Michael the first Inuk elected. Slowly the territorial council evolved into an elected, representative body, with Inuit actively involved in its workings. By the early seventies, Inuit in N.W.T. also organized themselves into the Inuit Tapirisat of Canada, an association with a broad mandate to preserve Inuit culture and promote Inuit interests. By the eighties, the ITC represented Inuit across the nation. 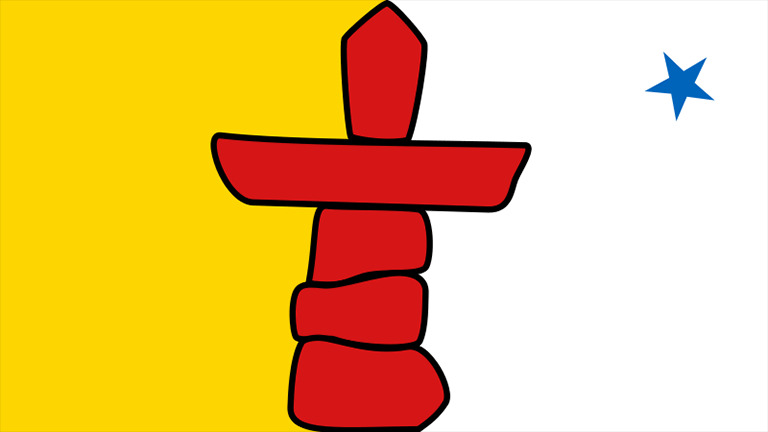 Nunavut was a long-standing goal from the ITC, which presented the notion formally as early as its first land claim in 1976. A lengthy treatise would be needed to detail the twists and turns around the question of division that occupied Inuit politicians in the late seventies through the eighties. Suffice to say, however, that a generation of astute political leaders emerged among Inuit, many of them women, who with patience, determination, creativity, and will achieved a vision: Nunavut. Nunavut is an Inuktitut word for “our land.” Unlike other First Nations in Canada, Inuit have not been interested in separate governing institutions. Rather, their particular situation as majority occupants of the Arctic has led them to promote the notion of increased power for their public governments (as opposed to aboriginal governments) as a vehicle for their political aspirations. They will be able to use their substantial majority to elect enough Inuit politicians that the government of Nunavut will be theirs. At least, they are able to do so for the forseeable future. Nunavut is in part the creation of a land claim, the 1933 Nunavut Land Settlement Agreement, which stipulated in one section the division of the N.W.T. The land claim is now administered by a body called the Nunavut Tungavik Incorporated, which, as a large capital and landholder, will be a major player representing the Inuit interests in Nunavut. Recommendations setting up the Nunavut government were made by a body called the Nunavut Implementation Commission. It was chaired by John Amagoalik, widely acknowledged as a founder of the territory. Its work ended in 1997 when an interim commissioner, former member of parliament Jack Anawak, was appointed to carry out its recommendations. Over the past six years, the Inuit community has been engaged in frenetic activity to have in place by the April 1, 1999, deadline, the human and material infrastructure demanded by the new government. Over the next eight years increased responsibilities will be devolved to the Government of Nunavut. By the end of that time it will be a province-like jurisdiction as the N.W.T. is today. Inuktitut is an official language in the new territory. The capital of Nunavut is Iqaluit (formerly Frobisher Bay), but every attempt has been made to decentralize and develop regional centres. There are three main regions in Nunavut: the communities on and near Baffin Island, the Kitikmeot communities on the coast and islands of the central Arctic, and the Kivilik communities in the region of the northwest coast of Hudson Bay. Every one of the twenty-six Nunavut communities (the total population amounts to a mere seventeen thousand) is its own unique microcosm, and each has developed its own strategy for dealing with the traumas of the past and the challenges of the future. The difference, for example, between Rankin Inlet, which on the surface has the rough-and-ready feel of a northern resource town, and nearby Whale Cove, where an older rhythm of life still prevails, is striking. While many would assess Nunavut’s ultimate chances based on its oil, gas, and mineral resource base, it should be noted that there is another resource with which Nunavut remains strikingly endowed — the continued presence of elders who hold a treasure-trove of invaluable knowledge, stories, skills, and values. Culture itself is one of the truly great assets of Inuit. For better or worse, so-called “authentic” aboriginal culture — and the commodities it can produce — will only increase in value over the next century. The degree that Nunavut, in its very forms of operation and decision making, reflects, embodies, and conveys the Inuit culture from which it has emerged, may ultimately determine its chances of success. At the time of this writing, Dr. Peter Kulchyski was chair of the department of native studies at Trent University. With Frank Tester, he coauthored Tammarniit [Mistakes]: Inuit Relocation in the Eastern Arctic 1939-1963. He conducts research on contemporary cultural politics in the Arctic and runs an annual summer school at Pangnirtung, Baffin Island. This article originally appeared in the April-May 1999 issue of The Beaver. In the Great War, the Canadian state found itself fighting two fronts. And the historical irony is striking: while thousands of working-class men and women were marched off to Europe, ostensibly to defend the rights and freedoms of democracy against tyranny, such highly prized ideals were routinely—and often severely—violated at home. George Brown's contributions to Canada can't be denied. And his fiery way with words is still making an impression.